The way that we get married now has changed so much over the years, and all for the better, I say! Weddings nowadays can be so much more about the union of two individuals. They can also be, and for many are, about the creation of new families. For many women their wedding day is about becoming a step-mother, as well as a wife. For many men it’s about becoming a step-dad, as well as a husband and more and more children are gaining new brothers and sisters and new adults in their lives to love and respect. Having been lucky enough to conduct ceremonies for many couples and their children, I’ve been able to see some wonderful ways that parents have involved all of the children in their lives and made their ceremonies feel as much about the little ones (or bigs ones! ), as it did about them. So here are my four suggestions of superb ways to honour your partner’s children or vice versa and make them feel that extra bit special on your wedding day. In fact, this advice is great for any children, whether they’re your own or not! How special that these two brothers got to be the ring bearers for their dad and lovely step-mum. A role they will never forget in years to come. Photo courtesy of Rebecca Louise. This little lady had a hell of a job and she did it fabulously! Photo by Owen Farrell. I used to think that it was only really a good idea for older children to do readings during ceremonies, but I have been surprised how over the years I have seen children as young as five and six deliver readings. I think the key is confidence. If a young child seems willing, able and confident, then why not let them? Maybe a good idea is, if there is more than one child, to let them do a reading together. Pair them up for moral support and a bit of company. You may even want to let older children choose a reading for themselves, again adding to their involvement and letting them feel like they have a responsible role to play in the ceremony. There are also some really great wedding readings out there, which can be read by children and adults alike, but which are definitely easier for children to read than some ‘traditional’ wedding readings. 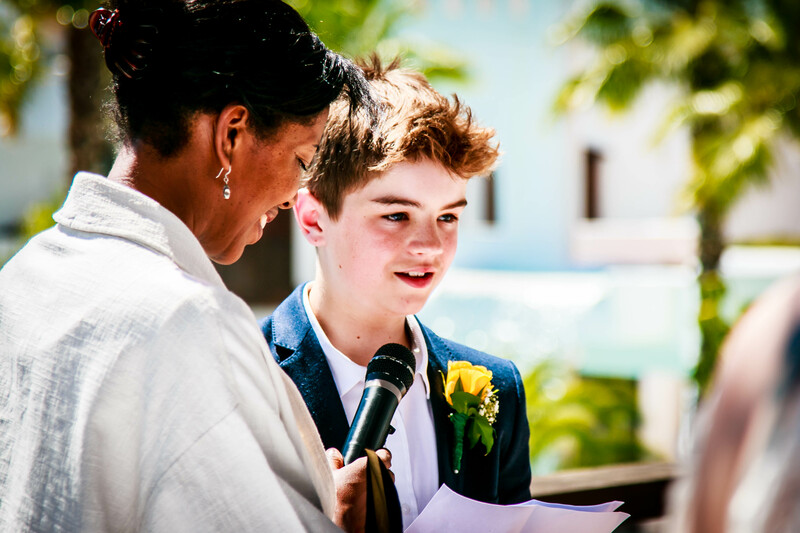 Readings are a great way to make an older child feel he or she has a special role in your ceremony. Candle ceremony – Instead of lighting the individual candles yourselves, an older child can light the candles and pass them on to you both to light the central candle. The symbolism of this would be pretty powerful too. It would be their way of saying they’re happy for your union and that they’re giving you their blessing by lighting the candle. So sweet. Obviously, it would be better if they didn’t burn themselves in the process, so maybe just use this for older kids or have someone else on standby to give little ones a hand. Hand-fasting ceremony – I did a lovely vow renewal ceremony last year where the couple’s two children helped to tie the bind to their wrists. It was really sweet. They giggled all the way through, but you could see that they were so chuffed to be involved. And it doesn’t matter if they don’t really do it properly as you or your celebrant can just adjust it a little, without them even noticing! Memory box ritual – if you plan on including a memory box in your ceremony, then there are a couple of ways that children can be involved in this. One way, is to ask them to contribute something for the box, maybe a letter to the two of you, a poem, a photo or special painting of you both. Or you could have them on hand to be a little memory box assistant, and let them explain/read out what all the items in the box are and what their significance is, before you place them all into the box. The Wine ceremony – before taking sips of the wine, you can ask the child to drink some of the wine and then they will fall asleep and it will be quite funny! THIS IS A JOKE, OBVIOUSLY! I just thought I’d drop that in because I have a stupid sense of humour! Although, that said, step children of drinking age may enjoy being a part of this ritual! I would! Good lad. Thought he’d try the ring out for good measure! Photo by Owen Farrell. Of all the ways to include children in a ceremony, allowing them to say their own vows is perhaps one of the hardest roles to carry out. Yet, that said, it has the scope to be so rewarding, heartfelt, tear-jerking and all round lovely. With all of these pointers I have mentioned, you need all children to be onboard with their role, but when it comes to saying a vow, you’re going to really really need them to be onboard. Especially, as children’s vows would usually take place before your own, so it will mean a child having his say, before you have said your own, which can of course be a little daunting, for some. Some probably wouldn’t even care!!! Any child who I have seen say their own vows, has always risen to the challenge. You and your partner know the child and know how best to present this particular ‘challenge’ to them. Maybe the key is to downplay it, or maybe they’re a child who needs to know it’s really important in order for them to take it seriously. You will know how best to approach it. So here are two really great ways that a child can say a vow. The first and easiest is a question vow. The plusses of this type of vow is that the child only has to answer the question. Yay! Which is great for little or shy kids. Here are some examples. Celebrant: Do you Blue Ivy stand here today to give your love and support to your mum (or name) and dad (or name)? Do you promise to love and respect them, to cuddle them when you need to, have fun with them when you want to and to be the best daughter and step daughter to them that you can be? Because vows like this are so personal, you may even find it easier and more meaningful to write your own question vow. Maybe, along with the child it might be something that you’ll all enjoying penning together. Here’s another example, perhaps for an older child. Vows like this can be written on a cue card to help prompt them, too. Will you love and honour your mum and step dad and to be a part of their happiness? Will you turn to them when you need to and let them help you with your troubles? Will you do all in your power to help keep a loving family unit, full of laughter, happiness and mutual respect? The second type of vow that can be said is a ‘statement vow.’ This is where the child would read a prepared statement, either that they have written under your guidance or that you have all helped to write together. I would never recommend writing a vow for a child without them having a say in it, or being 100% happy with the words that you are asking them to say. Harper Seven: I am happy to be here today to see mummy (or name) and daddy (or name) get married. I love them and they love me and together we have a special family. Thank you mummy (or name) and daddy (or name) for loving each other and for loving me. Another vow example, with a little humour too. Harper Seven: Thank you (name) for making daddy happy and helping him to have a smile on his face. Thank you for caring for him and making sure he wears matching socks. Thank you for making sure that we eat nice dinners, which are tasty and not burnt. Thank you for helping me with my homework when I need it and for being a good friend and loving step mum. I wish you both all the happiness in the world and I can’t wait to spend time with you both, as we have done and will continue to do. My goodness, I think I would cry my eyes out if these were said to me! have vows written out so that they can be read by the child. Saying vows is hard enough without trying to memorise them! If a child is really up for it they can be asked a question vow and say their own statement vow, too, which is nothing short of awesome. But one or the other is just as amazing. If there is no willing, there’s no way! As disappointing as it is, if the child’s not up for it, whether it’s doing a reading or vow, being a flower girl or being involved in a ritual, let them be. And bear in mind that children can continually change their minds, weekly, daily and hourly before the big day. Whenever a child is involved in ceremonies that I conduct, I even check up to half an hour beforehand that they are still onboard. So there you have it, four fab ways of involving step children on your big day. Good luck implementing these ideas. It’s so special to have a child involved in a ceremony and such a beautiful way of formally establishing a new family unit and celebrating the love amongst you all. Oh gosh, I’m getting all weepy. What’s a page boy and should I have one?